The second European satellite dedicated to delivering broadband internet connections has launched successfully. The six-tonne Ka-Sat lifted off atop a Proton rocket from Baikonur in Kazakhstan at 0351 local time on Monday (2151 GMT on Sunday). The flight to orbit lasted nine hours and 12 minutes. The Eutelsat-operated spacecraft will concentrate its services on the estimated tens of millions of European homes in so-called "not-spots". These are places where consumers cannot get a decent terrestrial connection. The spacecraft follows the Hylas-1 platform into orbit. This satellite, operated by Avanti Communications of London, was launched just last month. Ka-Sat, however, is considerably bigger, and has a notional capacity to serve up to two million households compared with Hylas's 300,000. Nevertheless, such is the scale of the under-served market in Europe that both platforms should be very profitable ventures, the two companies believe. "As many as 30 million households in Europe are not served at all or get high mediocrity of service," said Eutelsat CEO Michel de Rosen. "These could be people in the countryside or in the mountains, sometimes not very far from large cities. Ka-Sat is an answer to that problem," he told BBC News. Paris-based Eutelsat is one of the world's big three Fixed Satellite Services (FSS) companies, and transmits thousands of TV channels across its fleet of spacecraft. It already provides some internet capability on its existing platforms, but Ka-Sat is its first broadband-dedicated endeavour. Ka-Sat will sit about 36,000km above the equator at nine degrees East. Its communications payload, structure and propulsion system were prepared by EADS Astrium at its UK facilities in Stevenage and Portsmouth. Final testing of the spacecraft took place at Astrium's factory in Toulouse, France, before shipment to Baikonur. Ka-Sat has a total throughput of some 70Gbps. This will be channelled via 82 spot beams on to different market areas stretching from North Africa to southern Scandinavia. A very small segment of the Middle East will also be reached. Eutelsat has signed about 70 deals with distributors across the satellite's "footprint", and more would be signed over the next year, said Mr de Rosen. "It takes normally a few weeks for a satellite to become operational after launch," he explained. "In this case, it is more likely to be a few months. Expect Ka-Sat to be operational in the second half of the second quarter of 2011." The satellite will need to undertake some firings of its own propulsion system to circularise its final orbit. Ground controllers will also need a period of time to check out and commission all onboard systems. 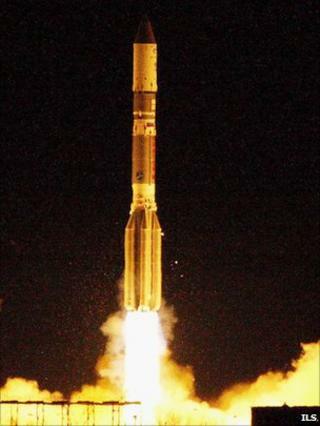 Ka-Sat's Proton rocket was under the spotlight for this flight. The Russian vehicle had failed on its previous outing, dumping three Glonass satellite-navigation spacecraft in the Pacific Ocean. An inquiry found the Proton's new Block DM-03 upper-stage had been over-fuelled, making it too heavy to achieve its required performance. International Launch Services (ILS), which runs the commercial operations of the Proton vehicle, used a different upper-stage for the Ka-Sat mission. This Breeze M stage has a good recent record. It was the eighth and last ILS-organised Proton mission of 2010.